Physically resembling Apple's HomePod, the Glow's main feature is automatically adjusted color temperature. One gesture, for instance, will trigger a 45-minute transition from bright conventional lighting to a dim red before shutting off. 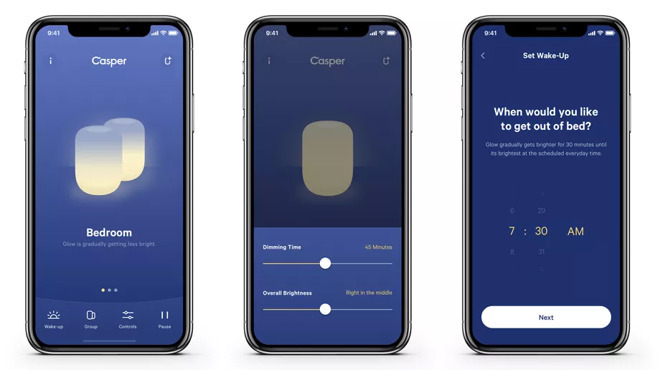 On the flipside of sleep it can gradually wake owners up over the course of 30 minutes, using a time picked in a companion iPhone app. 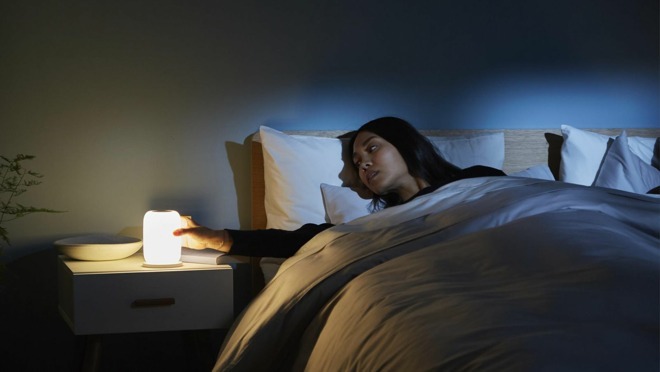 Functionally this is similar to smartbulbs by companies like Philips and LIFX. A gyroscope sensor lets owners control brightness by twisting. The product can be taken off its wireless charging station for walking around at night, and shaken to trigger a low-level lantern setting. A built-in battery is said to run for up to 7 hours during continuous use. The iPhone app also lets owners control power, pick from five preset modes, and sync multiple Glows together. So far Casper hasn't announced support for Apple HomeKit, Amazon Alexa, or any other third-party smarthome platforms. A single Glow costs $89. People wanting a pair can get them for $169. ..my GF used to wake me out of a deep sleep by violently opening the curtains, cup of coffee in hand. The noise was quite a jolt! I said to her, "I like to wake up slowly," and she said, "OK, no problem, but how will I 'know' you are ready for your coffee? We need a signal." I then, without missing a beat, farted quite audibly! I know, what a guy! P.S. How do I know their app is stealing and selling my data? Is it just me? Or are we heading to a 'platform' agnostic future as far as services? I much prefer and always have preferred Apple's approach as far as software, interfaces, hardware, etc., but it seems with TV, Music, Movies, photos, data, etc., etc., It's going to be available everywhere. I will only do Apple...mainly because of privacy. Only use Duck, duck Go and no Google, Facebook, Amazon, MS Twitter apps, at all. I try to limit my use third-party apps to the bare minimum! Dropping Dropbox for iCloud... a Credit Union App, Ting App for cellphone, But thinking of just using the websites for those services instead of Apps. I have a big circular Philips "sunrise" type light. At a glance, the design seems really nicely done. In practice, it's been the most infuriating user experience I think I've ever experienced by what should be a fairly simple bit of consumer electronics kit. I've had it for years and still hit the wrong buttons triggering the light or radio when trying to set an alarm for the morning, etc. Really fun when you share a bedroom. This may inspire me to look into a "smarter" alternative. I've been putting off getting into the HomeKit stuff, bulbs, doorknobs, etc. Although, I do like the idea of mood light behind the TV reflected on the wall. One of the first things I do when I move into a new place is put dimmers just about on every light. Makes it more romantic and inviting. I know, so Old School! But I don't want to have to pick up my iPhone every time I need to do something. I suppose, eventually, I'll be able to ask Siri to dim all the lights. But right now it seems somewhat expensive, fiddley and clunky! This isn't a HomeKit compatible product.